This guest blog post is by Troy Herman. Austin, Texas is known for many things worldwide: outstanding educational environments, LIVE music venues, an eclectic and accepting culture, sports and activities for everyone, and the birth of technology trends and startups. On top of all that, this city contains a growing population of health-conscience individuals. 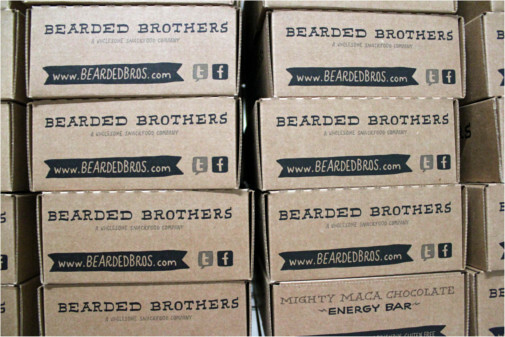 So there’s no better place for Bearded Brothers to make energy bars that fuel the active Austin lifestyle in an 100% natural, raw, vegan friendly, gluten- and soy-free way. Who Are the Bearded Brothers? The Bearded Brothers are Chris Herbert and Caleb Simpson (technically brothers-in-law). They naturally blend passion for a healthy and active lifestyle with the ability to share their passion with others. This combination resulted in the creation of an energy bar company based in Austin. If you read through the Bearded Brothers blog, speak with Chris or Caleb on the street, or follow them on their social networks, you’ll easily see that they’re not using any artificial marketing ploys. Down to their essence, they are all natural…just like their products. Chris, an avid disc golfer and outdoor enthusiast, brings eleven years of experience in the health and nutrition industry to the company. He has managed stores, assisted with partnerships in the industry, and worked with an herbal supplement company for seven years alone. This type of knowledge and experience has led to Bearded Brothers’ quality products and a deep understanding of what should go into them. Caleb, an avid rock climber and runner, also has a high-level understanding of how to choose healthy ingredients. From personal experience, he knows what an athlete needs to fuel extended marathons or grueling climbing expeditions. I am a passionate and avid disc golfer who promotes and plays the sport whenever I can. I am also a disabled veteran who stays very active. My lifestyle requires a selective diet when I am participating in outdoor activities and going about my daily life. I must always use caution with food and products I eat, to avoid counteracting the medications I need daily. Bearded Brothers’ all-natural products meet my stringent demands, when I need essential fuel to accomplish what I’m doing. Beyond the health benefits, Bearded Brothers matters to me as a company because they support the community wherever they go. For example, I first met Chris during a local charity disc golf event. He is a genuine disc golf player and as active as he promotes himself to be. After some discussion, he agreed to sponsor the charity event without hesitation. He clearly understood that helping out and giving back to the community should go much further than simply wanting to earn some free ad space. He genuinely cares about those around him in his community. How Did Bearded Brothers Come About? All packed up and ready to ship! Though Chris and Caleb had extensive industry knowledge and experience as I noted before, they started Bearded Brothers from the ground up. In November of 2010, they launched a Kickstarter campaign and video promotion to raise a modest $5,000. It didn’t take long for them to achieve their goal. By February 8, 2011, they had raised $5,515. In this age of competitive ideas, this was the first successful Kickstarter campaign I ever saw, born to the market as originally promised. 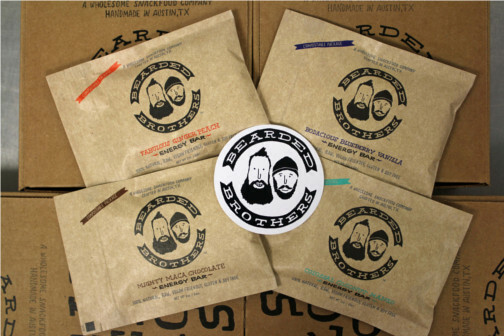 In March 2011, the first Bearded Brothers bars were pre-ordered, packaged, and shipped to eager investors and those looking for something all natural, raw, and great tasting. During that same month (yes, you could say it was a busy time), they also launched their product at SXSW, the world-famous music, film, and interactive conference that’s held annually in Austin. In one week alone, they handed out over 4,000 samples. Crowds from across the globe literally ate them up and wanted more. 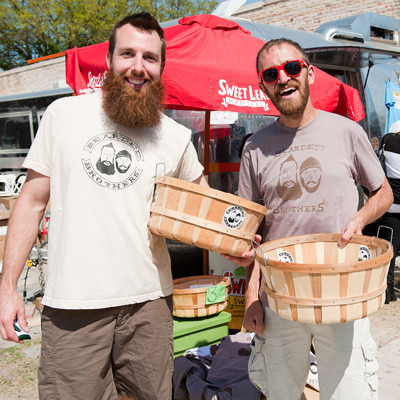 The donations raised, and the welcoming reception from the people they met, showed that Bearded Brothers provided something that had been absent from the market. They were fulfilling a widespread need. 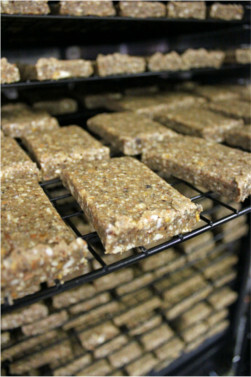 What you’ll find in these energy bars are 100% natural, raw, vegan friendly, gluten- and soy-free ingredients that have been meticulously weighed, measured, mixed, molded, dehydrated, packaged, sealed, stamped, labeled and boxed ALL BY HAND. Pardon me while I emphasize the last part: ALL BY HAND. Chris and Caleb perform this seemingly monumental and magical task in a community kitchen that is clean, sterile, and guaranteed to be gluten free. All surfaces, machines, and tools are gluten free and free of cross contamination. Their meticulous concern is for you and the reputation of their product. In their bars, you’ll find only the best ingredients needed for a healthy lifestyle. If you’re worried about eating “raw,” don’t be. You honestly won’t think about it once your taste buds get a delightful sample of the healthy pleasure that awaits you. 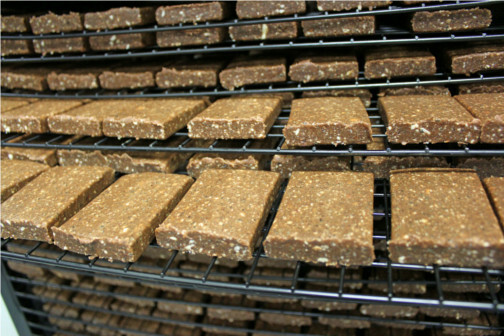 Each bar recipe combines complementary ingredients for delicious flavor, and to suit your body’s performance needs. Their packaging reflects the same concern for the world around us as they have for your body. The newest packaging is resealable, compostable, and earth friendly. Personally, the resealable package works great for me, allowing me to eat some during my activities and save the rest for later…though that’s always a challenge after tasting how good each bar is. There are currently four amazing flavors: Fabulous Ginger Peach, Colossal Coconut Mango, Bodacious Blueberry Vanilla, and Mighty Maca Chocolate. They are all my personal favorites. But if I had to choose, my priorities would be the chocolate for the natural energy boost and the ginger for its healing and recovery properties. Each bar comes in under 300 calories. This is a good measured amount for athletes who need that fueled edge to beat out their competition. 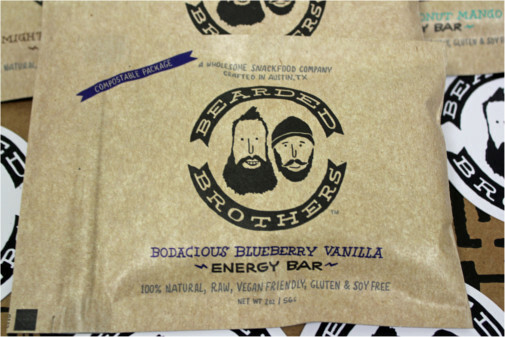 If you are local to the Austin area, there are many locations around town where you can find Bearded Brothers energy bars. Look for the distinguishable black and white Bearded Brothers logo that stands out amongst the colored noise of other “flashy” brands. They are trending in coffee shops, markets, and sporting stores, while expanding to more locations every day. If you are not in Austin, have no worries. Bearded Brothers is expanding across the United States, currently in 21 states and growing to spots as far away as Hawaii. Additionally, they have shipped their products to soldiers serving overseas and even private consumers in Saudi Arabia. Their natural health benefits know no borders and the world wants more. No matter where you are, you can order as many bars as you want from their website. If I’ve increased your awareness and desire for this locally-grown product, look for Bearded Brothers at your local hangouts and preferred shopping locales. If you don’t see them, ASK FOR THEM. It will be well worth the effort. You can also show your support by following them on Twitter and Facebook. I have spoken to many bearded men in my life, and those are some of the wisest words I have heard. Troy Herman is a member of the Professional Disc Golf Association (PDGA#32289) who currently lives in Austin, TX. He is a Board Member of Austin-based Waterloo Disc Golf Club, where he also manages the club’s website, Twitter and Facebook pages. Troy has been playing disc golf over 12 years competitively and non-competitively, in local and national events. He is an avid photographer, blogger, and writer. He has been published in Disc Golfer magazine and Yahoo News. He is always passionate about family, disc golf, and food. He also volunteers regularly to promote disc golf, clean parks and help build new ones.